Whilst our 2016/17 seminar series in 2016/17 was a great success, the Violence Studies network partners decided that our 2017/18 strategy to develop the network would be to place a focus on physically bringing scholars together in a format that would encourage dialogue across disciplines and genres of research. We decided to move away from single-speaker seminar events to host instead, a series of panel events which would bring together multiple scholars from different disciplinary backgrounds, and various areas of expertise to interrogate various specific ‘themes’ relating to the study of violence. In October 2017 we invited Professor Michael Gross, an ethicist from the University of Haifa, and Dr Jack McDonald of Kings College London to join Violence Studies founder Rachel Kowalski to debate the notion of ‘ethics’ in war. The papers and discussion which followed explored how the application of theories of ‘Just War’ might be problematic in the scenario of an Asymmetric conflict. This first panel event confirmed out notion that thematic and multi-scholar events would be the key to developing the network by opening conversations which were highly engaging and establishing links between scholars whose work is on some level interrelated or complimentary. Hence, when we were awarded with the status ‘TORCH Research Network’ from February 2018, we knew that this would be an approach we would continue to take, and that it would influence how we would prioritise the spending of the generous TORCH budget we were awarded for the remainder of the year. Throughout the 2018 Hilary, Trinity, and Michaelmas terms we hosted 3 further panel events, in addition to one solo-speaker seminar. 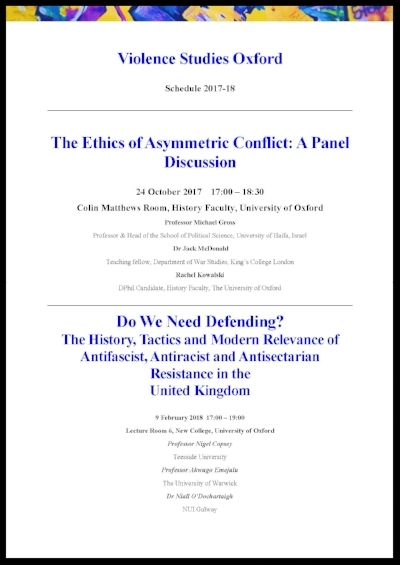 In February our panel ‘Do We Need Defending?’ was designed to encourage scholars to debate questions regarding the history, tactics and modern relevance of antifascist, antiracist and antisectarian resistance in the United Kingdom. Sadly, with only hours to go, our planned panel event program of speakers 4 speakers reduced dramatically to two as work and health issues claimed two of our speakers! In the absence of Professor Akwugo Emejulu (Warwick) and Dr Ben Walters (Activist from the Antifascist Network) - we were left with just two papers. Nevertheless, we preceded to hear about the complexities of The Battle of Cable Street from Professor Nigel Copsey, and the art of negotiation between the state, paramilitaries, and local communities in Northern Ireland during the 1969-1998 conflict from Professor Niall O’Dochartaigh. The papers were fascinating, but what was most exciting was the discussion which followed, as the scholars drew parallels and established the intricate differences between their case studies. This elevated the participation of the audience in the Q&A as the inclusive and vibrant exchanges between the audience and scholars began to tease out further theories in an effort to explain the disparate ways in which violence occurred and was shaped in the different case studies that had been presented. Having our speakers struck down with illness at the last minute was a theme which blighted our next panel event also. ‘British Imperial Responsibility?’ sought to being together scholars to reflect on the disparate approaches to post-conflict reconciliation and transitional justice in Malaya, Cyprus, Kenya, and Northern Ireland. Sadly, speaker Cheryl Lawther (Queens, Belfast) was unable to attend in the end. In a bid to compensate for her absence our network chairs Adam Brodie and Rachel Kowalski, both PhD Students at the University of Oxford with a special interest in the Northern Ireland troubles, sought to informally bridge the gap by representing the Northern Ireland situation in the summative discussions. The panel was once again a tremendous success with Dr Iosif Kovras (City University Of London) opening with a paper on Cyprus, followed by a paper on Malaya by Professor Karl Hack (The Open University) which were drawn together by Professor David Anderson (University of Warwick), whose paper transcended his area of expertise, Kenya, to reflect on how and why transitional justice varies around the globe. The interaction between the papers was a real highlight and something which the audience commented was tremendously effective. We concluded the Q&A by asking the speakers to reflect on areas within their own topics or the study of violence more generally which they felt we under researched. The more academically junior delegates commented that this was a particularly helpful and effective part of the event for them. 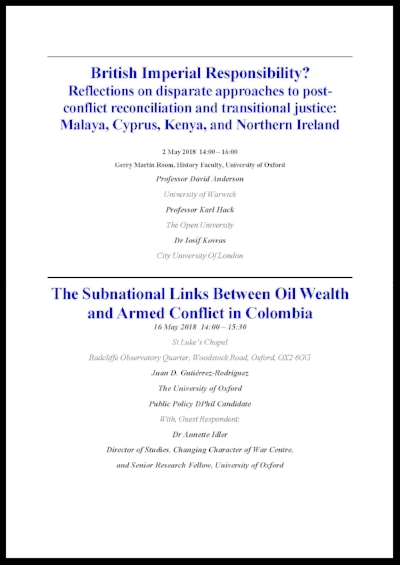 In May 2018 we hosted ‘The Subnational Links Between Oil Wealth and Armed Conflict in Colombia’ - a paper by Oxford PhD Student Juan D. Gutiérrez-Rodríguez with response from Dr Annette Idler, Director of Studies, Changing Character of War Centre, and Senior Research Fellow, at the University of Oxford. To have the interactive feel of a panel-event we asked the speaker to provide a copy of their paper to the respondent in advance of the event. This meant that Annette had time to absorb the material and formulate her responses. Annette gave her 15-minute response immediately after the paper, but before the Q&A. This was a really effective way of stimulating the discussion which followed. The event also demonstrated to the network partners the benefit to both the speaker and the audience of hosting more junior scholars to present under the umbrella of Violence Studies. Juan was a third year PhD student who was nearing the completion of a full draft of his thesis. Having the opportunity to present a full 45-60-minute paper was an excellent opportunity which he said that he would struggle to have found elsewhere as most of the conferences which are open for postgraduates attend allow papers of 10-20 minutes maximum. By contrast, the opportunity to present a longer paper allowed him to test out a full chapter of material, practice public speaking, and gain experience of responding to informed questions under pressure which is an invaluable way to prepare for the prospect of an eventual viva. And so, it was decided that this kind of event would be something we would like to encourage again in the future. And, in October 2018 we hosted Dr David Patrick, a post-doctoral researcher form the University of the Free State to discuss the research he conducted for his recently published monograph, Reporting Genocide. We were fortunate to be able to a scholar from a host institution so far away, because normally travel expenses of this sort would be too prohibitively expensive for our budget. But, thankfully on this occasion David’s home institution offered to pay for his travel and accommodation expenses because it was considered that the opportunity for David to speak at the University of Oxford would be beneficial to his career development. The audience who attended the paper were mixed, as the topic attracted scholars who study the representation of other topics in the media. The majority of our time & effort in 2018 was, however, directed towards the organising of our October 2018 conference. And, thanks to the funding we received from the History Faculty and DPIR earlier in the year, the majority of our TORCH budget was channelled towards the conference also. 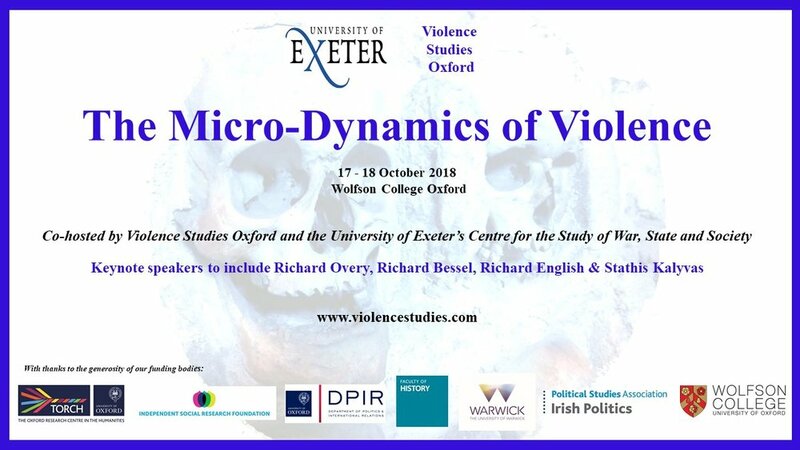 In October 2018, Violence Studies Oxford and The University of Exeter’s Centre for the Study of War, State and Society co-hosted ‘The Micro-Dynamics of Violence’, a two-day multi-disciplinary conference which brought together scholars of violence from various universities and research institutions. 25 Academics, From PhD Students to Professors of History, anthropology and social science drew on their various areas of expertise to debate two primary questions: firstly, how we as scholars write about violence, and secondly, how we understand violence as a phenomenon in its own right. We designed 8 panels from the abstracts we received that would speak across thematic issues. This was intended to generate the kind of fruitful discussion that could bring together research on disparate topics, periods of history, or parts of the world to consider the origins of either variation or continuity. When designing the program, we took the executive decision to decline the panel proposals we had received which brought together papers on a various issue, in their existing form. Instead, we decided to prioritise the use of a panel ‘themes’ which had the power to speak across broader issues, as opposed to isolating any particular issue to a single panel. For example, instead of accepting one of the pre-designed panels proposed regarding ‘Gender & Violence’ we decided that gender was an issue which should be represented in every panel of the program. This approach proved popular with the speakers, who responded positively to our decision to break up some of the papers which had been submitted as panel proposals to our call-for-papers. The first conference theme, ‘Writing Violence’ was explored with 2 thematic panels in addition to the keynote paper and roundtable discussion. The theme of panel 1, ‘Hidden and Taboo Violence’, saw Dr Becky Jinks raised the question of how we understand violence when the voices of the victims are suppressed, for instance, when the only sources we have are composed by systems of oppression. And Emily Bridger discussed the challenges facing the researcher gathering oral testimonies from victim-survivors in a way that is both sensitive and effective. The ‘Sources and Methodology’ panel explored this topic further with papers which considered the implications of quantitative research. The absence of nuance in the analysis of data which is incomplete or only surface-deep was raised by Rachel Kowalski, and Dr Stacy Hynd problematized the issue that scholars can be required to quantify complex phenomena such as the ‘child soldier’, for instance, when needing to satisfy the standards of a funding proposal. The day concluded with a keynote paper from Professor Richard Bessel with responses from the roundtable of panellists from the University of Exeter’s Centre for the Study of War, State and Society. Dr Gemma Clark led the discussion, drawing together some of the key questions raised by the keynote speaker, and the panels which had run throughout the day. For example, how do we as scholars accommodate for the notion that our ability to understand violence may be blighted by a personal ignorance born out of being in privileged position of having never personally witnessed violence. On day 2 of the conference the ‘Understanding Violence’ panels delved into the topic of how we can comprehend violence as a phenomenon in its own right. Presenters discussed the findings of research which examines episodes of violence or the experience of participants at the micro or individual level. Oxford PhD student Elena Butti, for example contributed to the ‘Pathways to Violence’ panel with a discussion of how stigma acts as a mechanism of self-fulfilling prophecy for the outcast youth of Colombia. The ‘Environments of Violence’ panel featured scholars whose work has a geographical dimension, such as Dr Thomas Leahy whose paper demonstrated the regional character of the IRA campaign in different parts of Northern Ireland. And the dynamics of the ‘Organisations of Violence’ were explored by panellists including Professor David Anderson whose presentation attested the intimate nature of the violence perpetrated in 1950s Kenya. The conference concluded with a less formal open-conversation style keynote panel of Professor Stathis Kalyvas and Professor Richard English chaired by Violence Studies network founder, Rachel Kowalski. Rachel encouraged the speakers to reflect on precisely what it was that had made their work so path-breaking. English, known for his approach of ‘talking to the terrorists’, and Kalyvas, whose Logic of Violence in Civil War, is the seminal work which saw theorists shifting from framing violence as illogical or barbaric to something which can have rational applications - explained their sense that it was their refusal to be constrained by the disciplinary boundaries which can limit understanding by making mythological approaches distinct and separate which took their work to the next level. The event was extremely fruitful and was well received by the speakers and those who attended in an audience capacity. And, as organisers we were able to see how well the papers worked together to interrogate the critical questions the conference was designed to raise . As such, it is hoped that we will be able to produce a publication output such as an edited volume based on the conference papers. Violence Studies has come a long way since it began in earnest in October 2016 as an unfunded fortnightly seminar series, The Oxford Seminar for the Study of Violence. The 2016/17 program was a tremendous success and was the origins of what has grown into the multi-university and international research network, Violence Studies.